Discussion in '2016 + Toyota Tacoma' started by Joisey, Feb 6, 2019. I want to hook up a battery minder to my Tacoma. I have a wall mounted unit that will handle 6 batteries, and outlets all over the garage. So basically I just have to find a place to put a waterproof socket on my truck that is easily accessible and not attractive to vandals and idiots in general. Any ideas for locations and sources for true waterproof sockets? The sockets need to be waterproof when closed. I'd prefer units with threaded lids or snap shut lids with gaskets. Plastic trumps metal because it blends with anything black, making it less visible. I found a spot below my headlight, a recessed black panel with horizontal ridges that does nothing. Another choice is inside the front wheel well, on the vertical surface behind the tire. As I don't go off road, more than to my property in WV, I can be lenient in it's placement. Just an aside...you don’t drive your vehicles that often? Really none of my business. Just curious. Either one of those locations if they work for your application. I don’t know of plugs. I’ve never had to set something like this up. I’m interested in learning more and seeing how it turns out. The last obe if thise I had actually had a little waterproof cap with it. If you have a Harley shop close to you you might check with them to see if they sell just the pigtail. HD does sell the pigtail and comes with a protective cap when not in use. Got one on my '14 Streetglide. I'm 63, my wife pushing 70. Both not in the best of health. In the winter, most body parts don't work well, so we stay inside for up to a month at a time. A large chest freezer feeds us well during these times. On a busy month, the truck gets used twice per month. No problem in warm weather, but a month of non use in the winter can tax a battery. I have the garage wired with a complete 12 volt charging system with outlets in each car bay and throughout the garage. This keeps the Husqvarna ZTR charged along with the quads and generator battery. The battery minder does an excellent job of maintaing up to six batteries at one time. Never an over or undercharge. In system cost me $400 for everything. Conduit, #10 THHN wire, red duplex outlets, handy boxes, face plates, battery maintainer, charge cords and GM Weatherpak connectors. The major portion of the cost was the wire. 12 volts DC suffers severe voltage drop over a distance. My garage is 42X80, so I got by with #10 wire by making a continous loop around the garage and back to the charger. The way the garage is divided, no charge outlet is more than 50 feet from the charger. Before, I was going thru 1 or 2 individual battery maintainers per year, plus the batteries they wrecked and the aggrevation of a dead or overcharged battery. In two years the system has paid for itself. Battery life is 2 to 3 times of normal life when not connected to a maintainer. Summer or winter, after use of the unit with the battery, it gets plugged into the maintainer until the next use. A friend that owns an airplane told me about the battery maintainer. Granted, the aviation one is built differently than the run of the mill cousin, but they work extremely well and has never failed me in 3 years, whether one or six batteries were connected to it. For a younger person with a few vehicles or toys it's a wise investment. Price shop. I bought mine on Amazon years back for $70 shipped. B-Man and Bogunn like this. Sorry about your health problems but it sounds like you are an idea man with mad skills! You just need one of these. They came with Battery Tenders I've bought over the years. Probably the best place to buy one is Amazon. My 14 SG came with one too! WooD, I thought of using one of those, but that leaves me with the end that connects to the charger dangling somewhere on the truck. 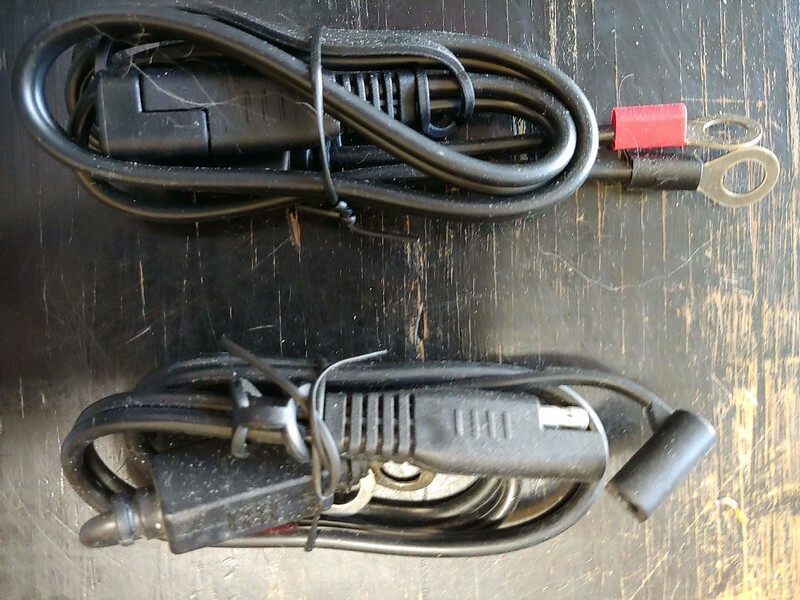 I was going to use one of those units from the battery to a stationary plug on my vehicle (in a hidden place to prevent vandalism) then plug my charge line into that. I have been leaning towards one of these http://www.batteryminders.com/ez-connector-mounting-screws/ mounted in the back side of the front wheel well. Out of sight and easy to access. So far, it is the best solution that I have found, especially with the waterproof connectors that it uses. You are correct, Amazon beats most retailers prices on this and a lot more products. B-Man, texasred and Bogunn like this. Thank you for your kind words. Healthwise, we hold our own compared to most our age. Stubbornness helps greatly. I was doing great until that lady from California turned left right in front of me and stopped broadside in the lane. I slid my Harley into her sideways at 50mph and left my body print in the side of her car. Blew out the side and back window of her car (Chrysler 300) and bent the B pillar. Wrecked my bike and broke some bones that day. Boy that woman was built. I've survived the sixties, the seventies, three motorcycle crashes, three dirt bike crashes, one Banshee crash, two totaled cars and some minor car crashes. I packed a lot of living into all of my years. At least when I die I'll know that I lived....unlike a lot of people. We should all try to live until we die....as opposed to just counting time until the inevitable. My mother passed 2 years ago at 101. Taught school for 30+ years. Volunteered tutor to underprivileged schools for several years. Active in church. Drove 30 miles round trip twice a week to the town she grew up in to visit her friends in the senior home. Played piano, canasta, dominos... And did her Jack La Lane exercises (remember him) every morning. Was driving right up to turning 100. She had a reason to wake up every day. There near the end she told my wife that it doesn’t matter how long you are here, “it’s not enough”. I try to live my life like that. Joisey and B-Man like this. You are a lucky man to have your Mother with you for so many years. I lost mine to Alzheimers in 1990 at age 72. No matter how old you are, you are still to young to lose a parent.
" A reason to wake up". How very true. Sometimes life goes on, long after the thrill of living is gone. Even if you only have memories, you still have the thrill. So many have nothing to look back on. We got Tacos and I’m about to get breakfast tacos for me and the spousal unit. And we’ve got plans to make memories this weekend. Hope you have the same. Will do. We're moving one step closer to getting out of his hell hole state and to living on my property in WV. Atomic Diesel, Bogunn and texasred like this. There ya go. Almost Heaven. West “By God” Virginia. I’m in the middle of the state. B-Man, texasred and Lil G like this. I'm in Pleasants County, just North of Rt. 50, about 15 miles outside of Parkersburg. Atomic Diesel, B-Man, texasred and 1 other person like this. Cool. Way up to the west of the panhandle. That’s a nice area. Beautiful country. My family has a farm in Tyler County. Beautiful country. I worked some storm restoration bout this time of year back in ‘03. Stayed in Parkersburg, had to criss the river into Ohio to find IH truck parts. Ice sure did a number on the trees and powerlines through there. Bogunn and texasred like this. Yes, it is beautiful country. 53 acres, all wooded with a stream and a rock outcropping that faces away from the street to put a house on. Every time I visit my property it gets harder and harder to leave. OR17TRD, B-Man and Bogunn like this.